Voltas, a TATA Group company, has launched its new range of ACs for the summer season, with an array of choices in terms of technology, features, aesthetics and price points. 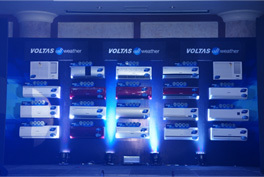 In developing the 2013 range, Voltas kept in mind consumers' varied requirements, with their diverse preferences and aesthetic tastes. All Weather ACs – Comfort all year round. India is home to a variety of climatic regions, ranging from tropical in the south to temperate and alpine in the Himalayan north. With the country’s geography and geology being climatically pivotal, Voltas has introduced its new range of All Weather ACs as a part of the new line up. With this launch, Voltas envisages a new road map for the entire category, by making air conditioning a year round phenomenon. Four key new features of All Weather AC’s, Insta Cool Compressor, Active Dehumidifier, Super Dust Guard and Intelligent Heating , brings forth the year round utility suited for different climatic conditions, and amplifies the consumer promise of “whatever the weather outside, you stay comfortable all year round’’. Insta Cool Compressor – The new T3 compressor enables instant cooling even at 52 degree Celsius Active Dehumidifier – Dehumidification mode keeps one comfortable even in peak humidity Super Dust Guard – Ensures that the air is clean and fresh in your room even in dusty conditions Intelligent Heating – Keeps you warm and comfortable even during extreme winter. For consumers, there is a wide choice of models with varied features, benefits and price points to choose from. 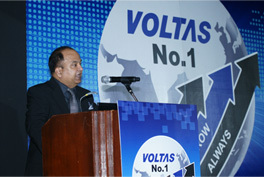 With this new launch of All Weather ACs, Voltas has further strengthened its All Weather positioning, and has made its No. 1 position in the market more distinct.